Sergio Leone’s ill-treated mob movie classic is heading back to the Cannes Film Festival this year in an all-new incarnation. The film has been painstakingly restored from the original negatives and includes a whopping 40 minutes of additional footage. A labour of love that’s been over a year in the making, the project will be finally unveiled at France’s most prestigious annual event – a fitting debut for the longer cut, as it was in Cannes where the film was initially screened 28 years ago. ONCE UPON A TIME IN AMERICA would sadly become director Leone’s swansong, as his long-gestating World War II epic, LENINGRAD, never got off the ground before his death in 1989 (though the film is currently in pre-production and cameras are set to roll for director Guiseppe Tornatore [CINEMA PARADISO] later this year). 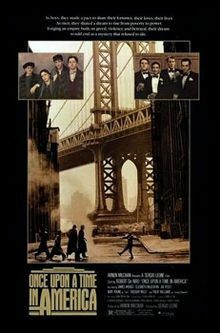 ONCE UPON A TIME IN AMERICA is something of a departure from the Italian westerns with which Leone made his name and is the epic tale of a group of young Jewish boys who become embroiled in New York’s criminal underworld during the prohibition era. Leone’s film is a sprawling masterpiece but its American distributor, the Ladd Company (who had similarly interfered with Ridley Scott’s BLADE RUNNER), was of the opinion that it was too long and its non-linear structure too confusing, insisting on cuts totaling almost an hour and a half before its release. The film fared better in Europe where it was released in a version that ran for 3 ¾ hours (the version that is currently available on DVD and Blu-ray from Warner Home Video) but stories have persisted of longer cuts and missing footage for many years. At present it is not exactly clear what the new material consists of and no announcement has been made relating to a home video release of the longer cut (though it is inevitable). I guess we’ll have to wait until the reviews following the Cannes screening begin to filter through next month. This entry was posted in Interesting, News and tagged Blu-ray, Cannes Film Festival, crime, Ennio Morricone, gangster, James Woods, Ladd Company, Leningrad Guiseppe Tornatore, mafia, Once Upon A Time in America, Redux, Robert De Niro, Sergio Leone, Warner Home Video by Paul. Bookmark the permalink.